On January 29, 1820, King George III died at Windsor Castle after 60 years on the throne, the longest reign of any English monarch up to that time. Extremely ill both mentally and physically for the last decade of his life, his son George, Prince of Wales had begun acting as Regent in 1811. Best remembered for losing the American colonies, this was only one troubling event in George III’s long reign. King George III was born in England, the country he ruled, a claim that neither his father nor grandfather could make. He entered the world on June 4, 1738 in London at Norfolk House, the first son of Frederick, Prince of Wales and his wife Augusta. His father died in 1761. 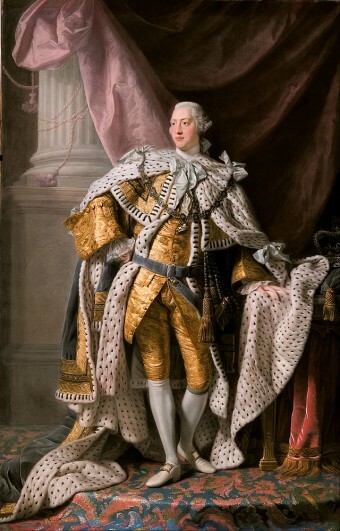 When his grandfather, King George II, also died in 1761, he ascended the throne as George III. He met his wife Augusta on their wedding day. Amazingly, they had a seemingly happy union that produced 16 kids. The King also never seems to have taken a mistress, a highly unusual situation for the times and his station. George probably would have been happier as a family man tending a small farm (agriculture was a passion of his), but he had a country to run. There were issues with France at the start of George’s reign, but when were there not problems with England’s oldest enemy? The bigger thorn in the royal side was rumblings of rebellion from the American colonies. Those cheeky subjects across the pond were not happy with what they considered an unfair tax system (after all, no Americans were seated in Parliament). They were particularly incensed when a tax was levied on every single piece of paper that changed hands in America in 1765. The Stamp Act, as it was called, was repealed, but things in America went from bad to worse. George hoped for a political solution to the problem, as it had never crossed his mind that his wayward subjects would not return to the English fold. Even so, he deferred to the opinions of his ministers as a Constitutional monarch, despite the fact that the colonists painted him as a despot and a tyrant. This, of course, was not enough to prevent the War of 1812. Those pesky Americans were not the only problems King George had to contend with during his long reign. There was also the French Revolution, turmoil in and eventual union with Ireland, the Napoleonic Wars, and the assassination of Prime Minister Spencer Perceval. His personal life presented its own set of woes. By 1788, the King was suffering from periodic bouts of dementia, today suspected to be the genetic disease porphyria, which rendered his behavior more and more erratic. His son George took over as regent in 1811, and he had the thankless job of trying to fulfill his progressively more unbalanced father’s demands. By 1814, he was beyond comprehension when the Congress of Vienna declared him the King (rather than Duke) of Hanover. When his beloved wife Augusta passed away in 1818, he was, perhaps mercifully in this instance, unaware of the fact. Totally blind and increasingly deaf, the old King died on January 29, 1820, with his favorite son Frederick, the Duke of York at his side. According to Wikipedia, King George III’s wife’s name was Charlotte not Augusta. Who is right? I caught that as well. From TIFO’s first resources link: “He married Charlotte of Mecklinburg-Strelitz in 1761”. (1) “Charlotte of Mecklenburg-Strelitz (Sophia Charlotte; 19 May 1744 – 17 November 1818) was the wife of King George III.” As the article had previously stated, “Augusta” was the name of George’s mother, not the name of his wife. (2) George and Charlotte saw the birth of fifteen children, not sixteen — although only God knows if Charlotte suffered any miscarriages.